At the end of the video, writer Jeffrey Goldberg nonchalantly says: "So it's just... all it is is a Hip Hop Hanukkah song written by the senior senator from Utah. That's all it is." Well, even more than that, it's a funky Hanukkah song written by a 75-year-old Mormon senator who wrote the song as a gift to the Jews. Ten years ago, I visited Orrin Hatch, the senior senator from Utah and a prominent member of the Church of Jesus Christ of Latter-day Saints, on Capitol Hill. I was writing for The New York Times Magazine and Hatch was thinking of running for president. We talked about politics for a few minutes, and then he said, "Have you heard my love songs?" No senator had asked me that question before. It turned out that Hatch was a prolific songwriter, not only of love songs, but of Christian spirituals as well. We spent an hour in his office listening to some of his music, a regular Mormon platter party. After five or six Christmas songs, I asked, him, "What about Hanukkah songs? You have any of those?" The article in Tablet got picked up this morning by the New York Times, which recognized just how many borders were being transcended with this story. "Adding to the project's only-in-America mishmash is that the song is performed by Rasheeda Azar, a Syrian-American vocalist from Indiana. But Mr. Hatch is the song's unquestioned prime mover, or macher. He is featured in the video, sitting stoic in the studio, head bobbing slightly, donning earphones and contributing backup vocals." At the end of the video, the senator unbuttons his dress shirt to expose the golden mezuzah necklace dangling from his neck. The Times article also notes that "Mezuzahs also adorn the doorways of his homes in Washington and Utah" and that he keeps a Torah in his Senate office. "Not a real Torah, but sort of a mock Torah," Senator Hatch said. "I feel sorry I’m not Jewish sometimes." The man who normally writes Christian music was quoted in the New York Times as saying, "This song means more to me than most of the songs I have ever written. People need to know the story of Hanukkah. It was a miracle." 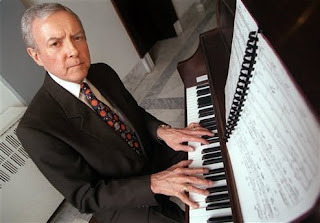 Senator Hatch said his ultimate goal would be for Barbra Streisand to perform one of his songs. Well, I'm sure seventy years ago many Christians weren't really sure what to feel when the Jewish songwriter Irving Berlin released "White Christmas." That's sort of how I feel now. But, a nice Hanukkah song is still a nice Hanukkah song. So, on behalf of Jewish people all over the world: "Thanks for the song Senator Hatch!"